Affiliate Tips - Increase your earnings with these free internet affiliate marketing articles. AffiliateSeeking.com AffiliateSeeking.com is an affiliate-programs directory where you can easily find and compare a large number of residual income programs, 2-tiered programs, affiliate-networks, and much more. Also includes program related articles. 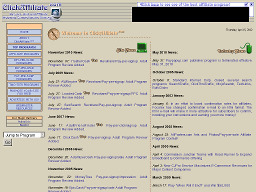 ClickAffiliate.com Provides reliable information about different pay-per-click and affiliate programs as well as business opportunities available on the net. All listed programs are rated and the site also carries the latest affiliate news. 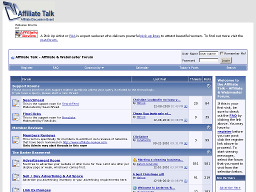 Affiliate-Talk.com A discussion forum that focuses on all topics related to affiliate programs. If you want to share your insights regarding various affiliate programs or read comments by past or current affiliate members, this is the site to visit. 100 Best Affiliate Programs The name says it all. If you're looking for the top affiliate programs on the Net, start here. A compact site with useful affiliate tips, articles and resources. SponsorDirectory.com An affiliate program directory and marketing resources guide. Over 1,500 affiliate programs listed. The site sports a top 10 list, a beginner's guide and a short scam list. Worth a visit. AssociateSearch.com Another excellent affiliate program directory with over 1,000 listed programs. Affiliate programs are nicely categorized with the usual reviews, recommendations and hot picks. A good starting point if you are thinking about generating income from your site traffic. 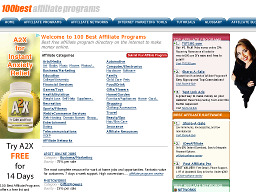 AffiliatesDirectory.com As the name suggests, an affiliate programs directory with more than 5,400 listed affiliate programs with ratings and reviews. The site also offers a useful info for both affiliates and merchants, including an affiliates academy, forums and more. 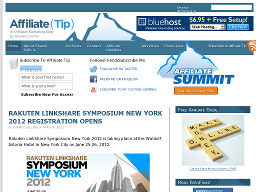 AffiliateTip.com A free resource to help affiliates with revenue share programs as well as a guide on how to promote them. 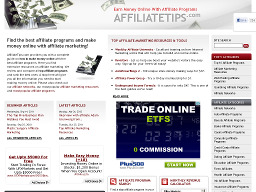 AffiliateTips.com Provides reviews, tips, articles and facts about affiliate marketing, SEO, programming, usability, web design, SEO-copy, conversion, etc. Over 100 programs reviewed. 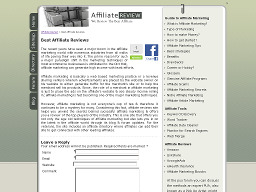 Affiliate-Review.com Affiliate-Review.com, as the name suggests, posts affiliate reviews. Most are of affiliate networks vs individual programs. The site also offers useful links to articles, forums and more.